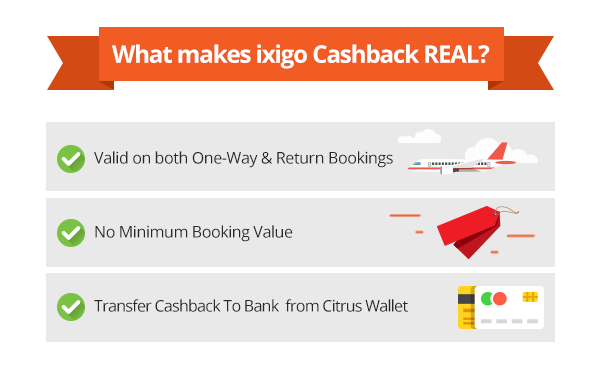 What makes ixigo Cashback REAL? Tired of the websites that claim to give you Cashback but end up giving you a bunch of points or virtual cash that can be used in limited places, for a limited period of time, etc? Fret no more! When you book through ixigo we guarantee ‘REAL’ Cashback. 1) ixigo cashback is valid on both one-way and return flight bookings. Hence, if you choose to book one-way tickets individually for your trip, you end up saving twice as much! 3) The best part is, the cashback is credited to your Citrus Wallet, from where you can transfer the entire amount to your bank account with just a few simple clicks. You can click here for more information on how to make this transfer. So what are you waiting for? Take advantage of the REAL ixigo Cashback and book your flight NOW!